Row crop markets are mixed in the overnight, as the USD trades unchanged amidst an evening of low volume. All 4 markets I cover for you come into this morning facing weekly losses although no real technical damage has been done in any market with the exception of KC Wheat. December corn futures trade unch at 368, January soybeans have retreated back into its comfort zone in the mid-880s after yesterday’s rumor fueled run up. December cotton futures are at 76.30, just above unch while Wheat futures remain in the dog house as KC makes a new monthly front month low while July futures trade are now solidly below 425. USDA export sales came in on average for corn, beans and wheat. We committed 35 million bushels of corn, 17 million bushels of soybeans and 16 million bushels of wheat. These numbers were right in the middle of lackluster expectation, well below a year ago in the same week. 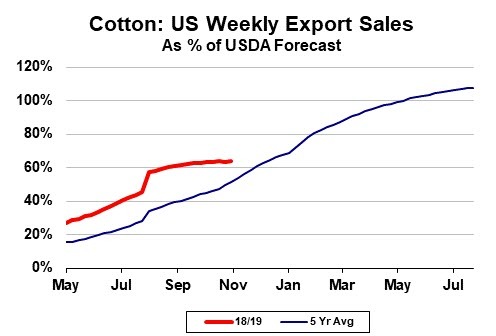 The story hasn’t changed for cotton sales, export sales come in a brutal number around 80 k bales. Another couple weeks of this and cotton will be staring up at its relativity to export pace. Grains and oilseeds are stepping back slightly as some enthusiasm has been taken out of the “deal” balloon with China. U.S. Trade reps denied a report Thursday that he told some industry executives that another round of U.S. tariffs on Chinese imports had been put on hold as the two nations pursue talks. Bob Lighthizer says any rumors regarding a deal are false. Commerce Secretary Wilbur Ross said, “We certainly won’t have a full formal deal by January. Impossible.” Like sands through the hourglass… trading this story will be impossible. I would remain in the camp of selling any rumor driven bean rallies. Producers with bushels to clear to by the end of the year should take 9.00 and risk being wrong in my opinion. Buy calls if you are shy, collars if you are aggressive. Regardless, there is a massive amount of unpriced beans ready to move if prices spike. There are a lot of rumors about discontent within the US camp as some want a deal and some want to play hardball. This Ag Web report doesn’t paint the rosiest of pictures. The big news of the day for wheat comes via the Saudi Wheat 12.5% tender that will close in a few hours. For the first time in a while, politics and price may be favoring the US winning the tender. The Saudi’s are picky when it comes to quality, Russian wheat won’t cut it. Argentina wheat this evening is offered a bit cheaper than other origins, but it’s doubtful they have the quality high protein product to deliver in this time frame. We know the story in Australia and Europe prices are high. This 475 K tender would be a boon for the US HRW markets and possibly confirm a more medium term low as we 2 weeks out from delivery. Spec traders may want to take a look at the March KC vs Chicago spread. At 10.25 cents, it offers good value once delivery passes. Both daily and weekly Bollinger bands are being pressured. Hedgers should be looking at 6.00 July calls for a dime. Wheat remains in a seasonal sell period into early December, I would not aggressively chase it here. Cotton finally got off the mat yesterday and broke its 4 day losing streak. Harvest out in Texas should pick up in the interim as weather windows open up. I make it a point to not moan about the weather, but it will be nice for everyone across the country to get a warm up in temps. Harvest yields in Texas are in a high range, quality will be a concern. 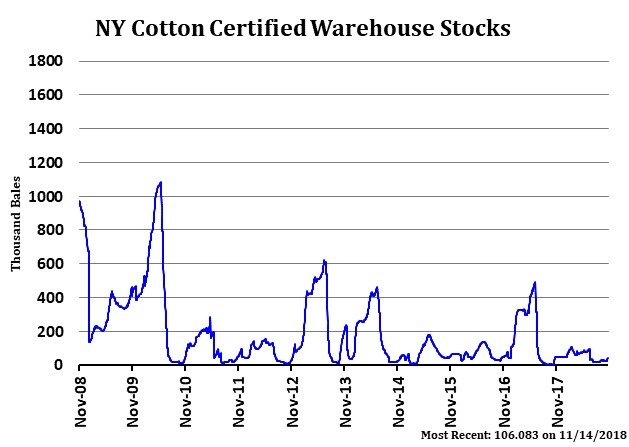 NY certified cotton stocks are climbing as supply comes in without a home. I like trying to re-own cotton but without a demand story these stocks will continue to climb. Now is the time the demand doldrums that begin in the early fall usually turn around. I would continue to follow the bearish seasonal into late next week. This article originally appeared in the This Week in Grain (T.W.I.G.) Newsletter “Friday Morning in Grain and Oilseeds 11/16” at 11/16/18 07:38:09 AM CT.